Our mission of the usher at Saint Patrick Catholic Church is that of hospitality. Our service is making parishioners and guests feel welcome and comfortable as we gather for our Eucharistic celebration. Our Ushers are able to see the presence of Chirst in each person as they arrive. The ministy of ushers is the oldest lay ministy in the Catholic Church. During the time of Chrtist, the doorkeepers of the temple numbered in the hundred’s and were the forerunners of today’s ushers. In 1972 Pope Paul VI abolished the order of porter and this important task was given over to the laity. Ensure the cleanliness and safety of the sanctuary and the gather space before and after Mass. Along with greeters, ushers, welcome church attendees as they arrive, especially people who appear to be unfamiliar with Saint Patrick Catholic Church. Assist in the seating of guest and parishioners especially guiding people with special needs to appropriate seating and discreetly guide latecomers to seats at appropriate points in the service. Collect the offering and immediately bring the offertory collection to the altar and collect it after Mass has ended. Organize the flow of the parish community as they come forward for Communion or other sacraments or events such as the veneration of the Cross during Lent. Monitor the congregation during the service to see if any church members have a special need that requires assistance. Hand out the weekly bulletin. Handle medical emergencies, service disruptions, or church evacuations with courage and composure. Are You Feeling Called to Be an Usher? Ushers are an essential part of Saint Patrick Catholic Church. Ushers are highly visible members of Saint Patrick Catholic Church. They must be dependable, hospitable, and gracious to all. This ministry is open to all adult parishioners. 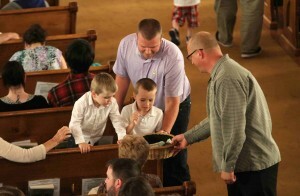 Ushering is a great way to meet parishioners. I want to welcome people at Mass!